Common side effects include nausea, vomiting, diarrhea, and loss of appetite. It often turns urine, sweat, and tears a red or orange color. Liver problems or allergic reactions may occur. It is part of the recommended treatment of active tuberculosis during pregnancy, though its safety in pregnancy is not known. Rifampicin is of the rifamycin group of antibiotics. It works by stopping the production of RNA by bacteria. Rifampicin was discovered in 1965, marketed in Italy in 1968, and approved in the United States in 1971. It is on the World Health Organization's List of Essential Medicines, the most effective and safe medicines needed in a health system. It is available as a generic medication. The wholesale cost in the developing world is about US$3.90 a month. In the United States a month of treatment is about $120. Rifampicin is made by the soil bacterium Amycolatopsis rifamycinica. Rifampicin is used for the treatment of tuberculosis in combination with other antibiotics, such as pyrazinamide, isoniazid, and ethambutol. For the treatment of tuberculosis, it is administered daily for at least 6 months. Combination therapy is used to prevent the development of resistance and to shorten the length of treatment. Resistance of Mycobacterium tuberculosis to rifampicin develops quickly when it is used without another antibiotic, with laboratory estimates of resistance rates from 10−7 to 10−10 per tuberculosis bacterium per generation. Rifampicin can be used alone in patients with latent tuberculosis infections to prevent or prolong the development of active disease because only small numbers of bacteria are present. A Cochrane review found no difference in efficacy between a 3- to 4-month regimen of rifampicin and a 6-month regimen of isoniazid for preventing active tuberculosis in patients not infected with HIV, and patients who received rifampicin had a lower rate of hepatotoxicity. However, the quality of the evidence was judged to be low. A shorter 2-month course of rifampicin and pyrazinamide had previously been recommended, but is no longer recommended due to high rates of hepatotoxicity. Rifampicin should be taken on an empty stomach with a glass of water. It is generally taken either at least an hour before meals or 2 hours after meals. Rifampicin is also used to treat nontuberculous mycobacterial infections including leprosy (Hansen's disease) and Mycobacterium kansasii. With multidrug therapy used as the standard treatment of Hansen's disease, rifampicin is always used in combination with dapsone and clofazimine to avoid causing drug resistance. In 2008, tentative evidence showed rifampicin may be useful in the treatment of methicillin-resistant Staphylococcus aureus (MRSA) in combination with other antibiotics, including in difficult-to-treat infections such as osteomyelitis and prosthetic joint infections. As of 2012, if rifampicin combination therapy was useful for pyogenic vertebral osteomyelitis was unclear. A meta-analysis concluded that adding adjunctive rifampicin to a β-lactam or vancomycin may improve outcomes in staphylococcus aureus bacteremia. However, a more recent trial found no benefit from adjunctive rifampicin. It is also used as preventive treatment against Neisseria meningitidis (meningococcal) infections. Rifampicin is also recommended as an alternative treatment for infections by the tick-borne pathogens Borrelia burgdorferi and Anaplasma phagocytophilum when treatment with doxycycline is contraindicated, such as in pregnant women or in patients with a history of allergy to tetracycline antibiotics. It is also sometimes used to treat infections by Listeria species, Neisseria gonorrhoeae, Haemophilus influenzae, and Legionella pneumophila. For these nonstandard indications, antimicrobial susceptibility testing should be done (if possible) before starting rifampicin therapy. The Enterobacteriaceae, Acinetobacter species, and Pseudomonas species are intrinsically resistant to rifampicin. It has been used with amphotericin B in largely unsuccessful attempts to treat primary amoebic meningoencephalitis caused by Naegleria fowleri. Rifampicin can be used as monotherapy for a few days as prophylaxis against meningitis, but resistance develops quickly during long-term treatment of active infections, so the drug is always used against active infections in combination with other antibiotics. Rifampicin is relatively ineffective against spirochetes, which has led to its use as a selective agent capable of isolating them in materials being cultured in laboratories. Rifampicin is used to treat pruritus caused by primary biliary cholangitis. The treatment-related adverse effects include hepatotoxicity, nephrotoxicity, hemolysis, and interactions with other drugs. The most serious adverse effect is hepatotoxicity, and patients receiving it often undergo baseline and frequent liver function tests to detect early liver damage. The more common side effects include fever, gastrointestinal disturbances, rashes, and immunological reactions. Taking rifampicin usually causes certain bodily fluids, such as urine, sweat, and tears, to become orange-red in color, a benign side effect that nonetheless can be frightening if it is not expected. This may also be used to monitor effective absorption of the drug (if drug color is not seen in the urine, the patient may wish to move the drug dose farther in time from food or milk intake). The discolorization of sweat and tears is not directly noticeable, but sweat may stain light clothing orange, and tears may permanently stain soft contact lenses. Since rifampicin may be excreted in breast milk, breast feeding should be avoided while it is being taken. Flu-like symptoms—chills, fever, headache, arthralgia, and malaise. Rifampicin has good penetration into the brain, and this may directly explain some malaise and dysphoria in a minority of users. 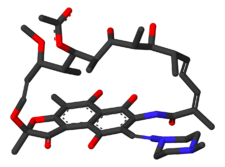 Rifampicin is a polyketide belonging to the chemical class of compounds termed ansamycins, so named because of their heterocyclic structure containing a napthoquinone core spanned by an aliphatic ansa chain. The napthoquinonic chromophore gives rifampicin its characteristic red-orange crystalline color. The critical functional groups of rifampicin in its inhibitory binding of bacterial RNA polymerase are the four critical hydroxyl groups of the ansa bridge and the napthol ring, which form hydrogen bonds with amino acid residues on the protein. Rifampicin is the 3-(4-methyl-1-piperazinyl)-iminomethyl derivative of rifamycin SV. Rifampicin is the most powerful known inducer of the hepatic cytochrome P450 enzyme system, including isoenzymes CYP2B6, CYP2C8, CYP2C9, CYP2C19, CYP3A4, CYP3A5, and CYP3A7. It increases metabolism of many drugs and as a consequence, can make them less effective, or even ineffective, by decreasing their levels. For instance, patients undergoing long-term anticoagulation therapy with warfarin have to increase their dosage of warfarin and have their clotting time checked frequently because failure to do so could lead to inadequate anticoagulation, resulting in serious consequences of thromboembolism. Rifampicin can reduce the efficacy of birth control pills or other hormonal contraception by its induction of the cytochrome P450 system, to the extent that unintended pregnancies have occurred in women who use oral contraceptives and took rifampicin even for very short courses (for example, as prophylaxis against exposure to bacterial meningitis). Other interactions include decreased levels and less effectiveness of antiretroviral agents, everolimus, atorvastatin, rosiglitazone, pioglitazone, celecoxib, clarithromycin, caspofungin, voriconazole, and lorazepam. Rifampicin is antagonistic to the microbiologic effects of the antibiotics gentamicin and amikacin. The activity of rifampicin against some species of mycobacteria can be potentiated by isoniazid (through inhibiting mycolate synthesis) and ambroxol (through host directed effects in autophagy and pharmacokinetics). Crystal structure data and biochemical data suggest that rifampicin binds to the pocket of the RNA polymerase β subunit within the DNA/RNA channel, but away from the active site. The inhibitor prevents RNA synthesis by physically blocking elongation, and thus preventing synthesis of host bacterial proteins. By this "steric-occlusion" mechanism, rifampicin blocks synthesis of the second or third phosphodiester bond between the nucleotides in the RNA backbone, preventing elongation of the 5' end of the RNA transcript past more than 2 or 3 nucleotides. Resistance to rifampicin arises from mutations that alter residues of the rifampicin binding site on RNA polymerase, resulting in decreased affinity for rifampicin. Resistance mutations map to the rpoB gene, encoding the beta subunit of RNA polymerase. The majority of resistance mutations in E. coli are in 3 clusters on rpoB. Cluster I is amino acids 509 to 533, cluster II is amino acids 563 to 572, and cluster III is amino acid 687. When describing mutations in rpoB in other species, the corresponding amino acid number in E. coli is usually used. In Mycobacterium tuberculosis, the majority of mutations leading to rifampicin resistance are in cluster I, in a 81bp hotspot core region called RRDR for "rifampcin resistance determining region". A change in amino acid 531 from serine to leucine arising from a change in the DNA sequence of TCG to TTG is the most common mutation. Tuberculosis resistance has also occurred due to mutations in the N-terminal region of rpoB and cluster III. An alternative mechanism of resistance is through Arr-catalyzed ADP-ribosylation of rifampicin. With the assistance of the enzyme Arr produced by the pathogen Mycobacterium smegmatis, ADP-ribose is added to rifampicin at one of its ansa chain hydroxy groups, thereby inactivating the drug. Mycobacterial resistance to rifampicin may occur alone or along with resistance to other first line antitubercular drugs. Early detection of such multidrug or extensively drug-resistant tuberculosis is critical in improving patient outcomes by instituting appropriate second-line treatments, and in decreasing transmission of drug-resistant TB. Traditional methods of detecting resistance involve mycobacterial culture and drug susceptibility testing, results of which could take up to 6 weeks. Xpert MTB/RIF assay is an automated test that can detect rifampicin resistance, and also diagnose tuberculosis. A Cochrane review updated in 2014 concluded that for rifampicin resistance detection, Xpert MTB/RIF was accurate, that is (95%) sensitive and (98%) specific. Orally administered rifampicin results in peak plasma concentrations in about 2–4 hours. 4-Aminosalicylic acid (another antituberculosis drug) significantly reduces absorption of rifampicin, and peak concentrations may be lower. If these two drugs must be used concurrently, they must be given separately, with an interval of 8 to 12 hours between administrations. Rifampicin is easily absorbed from the gastrointestinal (GI) tract; its ester functional group is quickly hydrolyzed in bile, and it is catalyzed by a high pH and substrate-specific esterases. After about 6 hours, almost all of the drug is deacetylated. Even in this deacetylated form, rifampicin is still a potent antibiotic; however, it can no longer be reabsorbed by the intestines and is eliminated from the body. Only about 7% of the administered drug is excreted unchanged in urine, though urinary elimination accounts for only about 30% of the drug excretion. About 60% to 65% is excreted through feces. The half-life of rifampicin ranges from 1.5 to 5.0 hours, though hepatic impairment significantly increases it. Food consumption inhibits its absorption from the GI tract, and the drug is more quickly eliminated. When rifampicin is taken with a meal, its peak blood concentration falls by 36%. Antacids do not affect its absorption. The decrease in rifampicin absorption with food is sometimes enough to noticeably affect urine color, which can be used as a marker for whether or not a dose of the drug has been effectively absorbed. Rifampicin inhibits bacterial RNA polymerase, thus it is commonly used to inhibit the synthesis of host bacterial proteins during recombinant protein expression in bacteria. RNA encoding for the recombinant gene is usually transcribed from DNA by a viral T7 RNA polymerase, which is not affected by rifampicin. In 1957, a soil sample from a pine forest on the French Riviera was brought for analysis to the Lepetit Pharmaceuticals research lab in Milan, Italy. There, a research group headed by Piero Sensi and Maria Teresa Timbal discovered a new bacterium. This new species produced a new class of molecules with antibiotic activity. Because Sensi, Timbal and the researchers were particularly fond of the French crime story Rififi (about a jewel heist and rival gangs), they decided to call these compounds "rifamycins". After two years of attempts to obtain more stable semisynthetic products, a new molecule with high efficacy and good tolerability was produced in 1965 and was named "rifampicin". Rifampicin was first sold in Italy in 1968 and was approved by the FDA in 1971. Rifampicin is the INN and BAN, while rifampin is the USAN. Rifampicin may be abbreviated R, RMP, RA, RF, or RIF (US). Rifampicin is also known as rifaldazine, rofact, and rifampin in the United States, also as rifamycin SV. Rifampicin is available under many brand names worldwide. ^ "Rifampicin (CAS 13292-46-1)". Santa Cruz Biotechnology Product Block. Santa Cruz Biotechnology. Archived from the original on 27 November 2014. Retrieved 14 November 2014. ^ a b c d e f g h i j k l "Rifampin". The American Society of Health-System Pharmacists. Archived from the original on 2015-09-07. Retrieved Aug 1, 2015. ^ a b c Sensi P (1983). "History of the development of rifampin". Reviews of Infectious Diseases. 5 Suppl 3: S402–6. doi:10.1093/clinids/5.supplement_3.s402. JSTOR 4453138. PMID 6635432. ^ Oxford Handbook of Infectious Diseases and Microbiology. OUP Oxford. 2009. p. 56. ISBN 978-0-19-103962-1. Archived from the original on 2015-11-24. ^ a b McHugh, Timothy D. (2011). Tuberculosis: diagnosis and treatment. Wallingford, Oxfordshire: CAB International. p. 219. ISBN 978-1-84593-807-9. ^ Hamilton, Richard J. (2014). Tarascon pocket pharmacopoeia: 2014 deluxe lab-pocket edition (15 ed.). Sudbury: Jones & Bartlett Learning. p. 39. ISBN 978-1-284-05399-9. ^ Organization, World Health (2010). Treatment of tuberculosis: guidelines. ISBN 978-92-4-154783-3. ^ Long, James W. (1991). Essential Guide to Prescription Drugs 1992. New York: HarperCollins Publishers. pp. 925–929. ISBN 978-0-06-273090-9. ^ Erlich H, Doolittle WF, Neuhoff V (1973). Molecular Biology of Rifamycin. New York, NY: MSS Information Corporation. pp. 44–45, 66–75, 124–130. ^ a b c d Goldstein BP (September 2014). "Resistance to rifampicin: a review". The Journal of Antibiotics. 67 (9): 625–30. doi:10.1038/ja.2014.107. PMID 25118103. ^ David HL (November 1970). "Probability distribution of drug-resistant mutants in unselected populations of Mycobacterium tuberculosis". Applied Microbiology. 20 (5): 810–4. PMC 377053. PMID 4991927. ^ a b Sharma SK, Sharma A, Kadhiravan T, Tharyan P (July 2013). "Rifamycins (rifampicin, rifabutin and rifapentine) compared to isoniazid for preventing tuberculosis in HIV-negative people at risk of active TB". The Cochrane Database of Systematic Reviews (7): CD007545. doi:10.1002/14651858.CD007545.pub2. PMID 23828580. ^ Centers for Disease Control Prevention (CDC) (August 2003). "Update: adverse event data and revised American Thoracic Society/CDC recommendations against the use of rifampin and pyrazinamide for treatment of latent tuberculosis infection—United States, 2003". MMWR. Morbidity and Mortality Weekly Report. 52 (31): 735–9. PMID 12904741. ^ "Rifampin oral: Uses, Side Effects, Interactions, Pictures, Warnings & Dosing – WebMD". WebMD. WebMD. Archived from the original on 22 November 2014. Retrieved 13 November 2014. ^ Chambers, Henry F; Gilbert, David N; Eliopoulos, Georges M; Saag, Michael S (2015). The Sanford Guide to Antimicrobial Therapy 2015. ISBN 978-1-930808-84-3. ^ Perlroth J, Kuo M, Tan J, Bayer AS, Miller LG (April 2008). "Adjunctive use of rifampicin for the treatment of Staphylococcus aureus infections: a systematic review of the literature". Archives of Internal Medicine. 168 (8): 805–19. doi:10.1001/archinte.168.8.805. PMID 18443255. ^ Pola E, Logroscino CA, Gentiempo M, Colangelo D, Mazzotta V, Di Meco E, Fantoni M (April 2012). "Medical and surgical treatment of pyogenic spondylodiscitis". European Review for Medical and Pharmacological Sciences. 16 Suppl 2: 35–49. PMID 22655482. ^ Russell CD, Lawson McLean A, Saunders C, Laurenson IF (June 2014). "Adjunctive rifampicin may improve outcomes in Staphylococcus aureus bacteraemia: a systematic review". Journal of Medical Microbiology. 63 (Pt 6): 841–8. doi:10.1099/jmm.0.072280-0. PMID 24623637. ^ Thwaites GE, Scarborough M, Szubert A, Nsutebu E, Tilley R, Greig J, Wyllie SA, Wilson P, Auckland C, Cairns J, Ward D, Lal P, Guleri A, Jenkins N, Sutton J, Wiselka M, Armando GR, Graham C, Chadwick PR, Barlow G, Gordon NC, Young B, Meisner S, McWhinney P, Price DA, Harvey D, Nayar D, Jeyaratnam D, Planche T, Minton J, Hudson F, Hopkins S, Williams J, Török ME, Llewelyn MJ, Edgeworth JD, Walker AS (February 2018). "Adjunctive rifampicin for Staphylococcus aureus bacteraemia (ARREST): a multicentre, randomised, double-blind, placebo-controlled trial". Lancet. 391 (10121): 668–678. doi:10.1016/S0140-6736(17)32456-X. PMC 5820409. PMID 29249276. ^ Wormser GP, Dattwyler RJ, Shapiro ED, Halperin JJ, Steere AC, Klempner MS, Krause PJ, Bakken JS, Strle F, Stanek G, Bockenstedt L, Fish D, Dumler JS, Nadelman RB (November 2006). "The clinical assessment, treatment, and prevention of lyme disease, human granulocytic anaplasmosis, and babesiosis: clinical practice guidelines by the Infectious Diseases Society of America". Clinical Infectious Diseases. 43 (9): 1089–134. doi:10.1086/508667. PMID 17029130. ^ Thomas RJ, Dumler JS, Carlyon JA (August 2009). "Current management of human granulocytic anaplasmosis, human monocytic ehrlichiosis and Ehrlichia ewingii ehrlichiosis". Expert Review of Anti-Infective Therapy. 7 (6): 709–22. doi:10.1586/eri.09.44. PMC 2739015. PMID 19681699. ^ "Rifampicin". Archived from the original on October 2, 2014. Retrieved August 22, 2014. ^ Leschine SB, Canale-Parola E (December 1980). "Rifampin as a selective agent for isolation of oral spirochetes". Journal of Clinical Microbiology. 12 (6): 792–5. PMC 273700. PMID 7309842. ^ Charity JC, Katz E, Moss B (March 2007). "Amino acid substitutions at multiple sites within the vaccinia virus D13 scaffold protein confer resistance to rifampicin". Virology. 359 (1): 227–32. doi:10.1016/j.virol.2006.09.031. PMC 1817899. PMID 17055024. ^ Sodeik B, Griffiths G, Ericsson M, Moss B, Doms RW (February 1994). "Assembly of vaccinia virus: effects of rifampin on the intracellular distribution of viral protein p65". Journal of Virology. 68 (2): 1103–14. PMC 236549. PMID 8289340. ^ "Rifampicin (Rifampin) - The Antimicrobial Index Knowledgebase—TOKU-E". toku-e.com. Archived from the original on 2014-12-09. ^ Gieffers J, Solbach W, Maass M (October 1998). "In vitro susceptibilities of Chlamydia pneumoniae strains recovered from atherosclerotic coronary arteries". Antimicrobial Agents and Chemotherapy. 42 (10): 2762–4. doi:10.1128/AAC.42.10.2762. PMC 105936. PMID 9756794. ^ Trivedi, Hirsh D; Lizaola, Blanca; Tapper, Elliot B; Bonder, Alan (2017). "Management of Pruritus in Primary Biliary Cholangitis: A Narrative Review". The American Journal of Medicine. 130 (6): 744.e1–744.e7. doi:10.1016/j.amjmed.2017.01.037. PMID 28238692. ^ Pugazhenthan Thangaraju; Hosanna Singh; M Punitha; VC Giri; MK Showkath Ali. (2015). "Hyperpigmentation, a marker of rifampicin overuse in leprosy patient: An incidental finding". Sudan Medical Monitor. 10 (1): 25–26. doi:10.4103/1858-5000.157506. ^ "Rifampin oral: Uses, Side Effects, Interactions, Pictures, Warnings & Dosing—WebMD". WebMD. WebMD. Archived from the original on 22 November 2014. Retrieved 13 November 2014. ^ a b c Campbell EA, Korzheva N, Mustaev A, Murakami K, Nair S, Goldfarb A, Darst SA (March 2001). "Structural mechanism for rifampicin inhibition of bacterial rna polymerase". Cell. 104 (6): 901–12. doi:10.1016/s0092-8674(01)00286-0. PMID 11290327. ^ Bennett, John (2015). Principles and Practice of Infectious Diseases. Elsevier Health Sciences. p. 339. ^ "Division of Clinical Pharmacology | Indiana University Department of Medicine". Medicine.iupui.edu. 2011-09-27. Archived from the original on 2011-11-05. Retrieved 2011-11-07. ^ Collins, R Douglas. Atlas of Drug Reactions. New York, NY: ChurchillLivingstone, 1985. p. 123. ^ Riss J, Cloyd J, Gates J, Collins S (August 2008). "Benzodiazepines in epilepsy: pharmacology and pharmacokinetics". Acta Neurologica Scandinavica. 118 (2): 69–86. doi:10.1111/j.1600-0404.2008.01004.x. PMID 18384456. ^ Mdluli K, Swanson J, Fischer E, Lee RE, Barry CE (March 1998). "Mechanisms involved in the intrinsic isoniazid resistance of Mycobacterium avium". Molecular Microbiology. 27 (6): 1223–33. doi:10.1046/j.1365-2958.1998.00774.x. PMID 9570407. ^ Choi SW, Gu Y, Peters RS, Salgame P, Ellner JJ, Timmins GS, Deretic V (July 2018). "Ambroxol induces autophagy and potentiates Rifampin antimycobacterial activity". Antimicrobial Agents and Chemotherapy. 62 (9): AAC.01019–18. doi:10.1128/AAC.01019-18. PMC 6125555. PMID 30012752. ^ Calvori C, Frontali L, Leoni L, Tecce G (July 1965). "Effect of rifamycin on protein synthesis". Nature. 207 (995): 417–8. doi:10.1038/207417a0. PMID 4957347. ^ a b Feklistov A, Mekler V, Jiang Q, Westblade LF, Irschik H, Jansen R, Mustaev A, Darst SA, Ebright RH (September 2008). "Rifamycins do not function by allosteric modulation of binding of Mg2+ to the RNA polymerase active center". Proceedings of the National Academy of Sciences of the United States of America. 105 (39): 14820–5. doi:10.1073/pnas.0802822105. PMC 2567451. PMID 18787125. ^ Pierre-Audiger, C.; Gicquel, B. "The Contribution of Molecular Biology in Diagnosing Tuberculosis and Detecting Antibiotic Resistance" (PDF). Molecular TB. Archived (PDF) from the original on 2017-01-16. ^ Baysarowich J, Koteva K, Hughes DW, Ejim L, Griffiths E, Zhang K, Junop M, Wright GD (March 2008). "Rifamycin antibiotic resistance by ADP-ribosylation: Structure and diversity of Arr". Proceedings of the National Academy of Sciences of the United States of America. 105 (12): 4886–91. doi:10.1073/pnas.0711939105. PMC 2290778. PMID 18349144. ^ Policy Framework for Implementing New Tuberculosis Diagnostics (PDF). Geneva: World Health Organization. 2011. Archived (PDF) from the original on 9 October 2016. Retrieved 21 March 2016. ^ Steingart KR, Schiller I, Horne DJ, Pai M, Boehme CC, Dendukuri N (January 2014). "Xpert® MTB/RIF assay for pulmonary tuberculosis and rifampicin resistance in adults". The Cochrane Database of Systematic Reviews (1): CD009593. doi:10.1002/14651858.CD009593.pub3. PMC 4470349. PMID 24448973. ^ Peloquin CA, Namdar R, Singleton MD, Nix DE (January 1999). "Pharmacokinetics of rifampin under fasting conditions, with food, and with antacids". Chest. 115 (1): 12–8. doi:10.1378/chest.115.1.12. PMID 9925057. ^ Hardman, Joel G., Lee E. Limbird, and Alfred G. Gilman, eds. "Rifampin." The Pharmacological Basis of Therapeutics. 10th ed. United States of America: The McGraw-Hill Companies, 2001. pp. 1277–1279. ^ "Il chimico che salvò molte vite". corriere.it. Archived from the original on 2014-01-09. ^ Aronson J (October 1999). "That's show business". BMJ. 319 (7215): 972. doi:10.1136/bmj.319.7215.972. PMC 1116803. PMID 10514162. ^ Moncalvo F, Moreo G (1966). "[Preliminary clinical studies on the use of a new oral rifamycin (Rifaldazine) in the therapy of pulmonary tuberculosis. (Preliminary note)]". Giornale Italiano delle Malattie del Torace. 20 (3): 120–31. PMID 5974175. ^ "Rifampicin". Chemical Safety Information from Intergovernmental Organizations. International Programme on Chemical Safety. Archived from the original on 31 October 2017. Retrieved 14 November 2014. ^ US granted 3963705, Bruzzese T, "Process for the preparation of rifampicin", issued 13 November 1979, assigned to Holco Investment Inc. This page was last edited on 19 March 2019, at 18:32 (UTC).